How long can you go without food? Proteus anguinus is a Salamander which is commonly known as an olm. 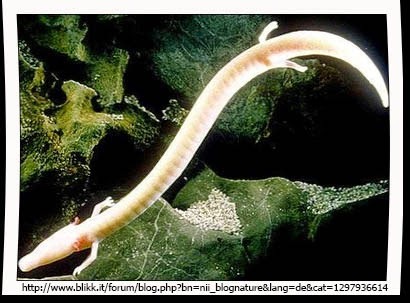 The olm has adapted to life in underground caves and displays many characteristics which are considered troglodytic such as blindness and pale skin. They are also interesting because although they are amphibians they are completely aquatic, living their entire lives in the water. They almost certainly evolved from an ancestor with terrestrial adults. They have also adapted to the scarcity of food in some of those cave ecosystems. They can smell food better than any other amphibian, and as they may not get food very regularly they have developed very efficient means of storing energy in their liver. They can live up to ten years without eating. The olm is only found in the limestone caves of central Europe and the Baulkans.